LaCie LaCie Big Disk Extreme with Triple Interface delivers seriously impressive capacity while reaching never-before-seen transfer rates that are up to 50 percent faster than 1st regular generation FireWire 800 drives*. With FireWire 800, FireWire 400, and Hi-Speed USB 2.0 interfaces, this plug & play hard drive can help you share data among the widest range of user platforms. Achieve a transparent, built-in RAID 0 array without complicated configuration with its compact 5.25” 1U design. Use it to store presentations, archive image banks or pre-press files, or exchange audio/video projects. The combination of Extreme speed and huge capacity make it ideal for audio/video professionals working on large-scale editing projects or wanting to chain FireWire or iLink DV cameras. Comments: 1GB (gigabyte) = 1,000,000,000 (1 billion) bytes. 1TB (terabyte) = 1000GB. Total accessible capacity varies depending upon operating environment (up to 5-10% less). 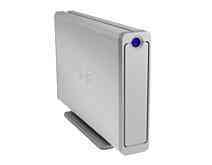 *LaCie Big Disk Extreme with Triple Interface maximum performance using FireWire 800 connection when tested and compared with LaCie first-generation FireWire 800 drives. Performance may vary depending on user’s data and computer configuration.